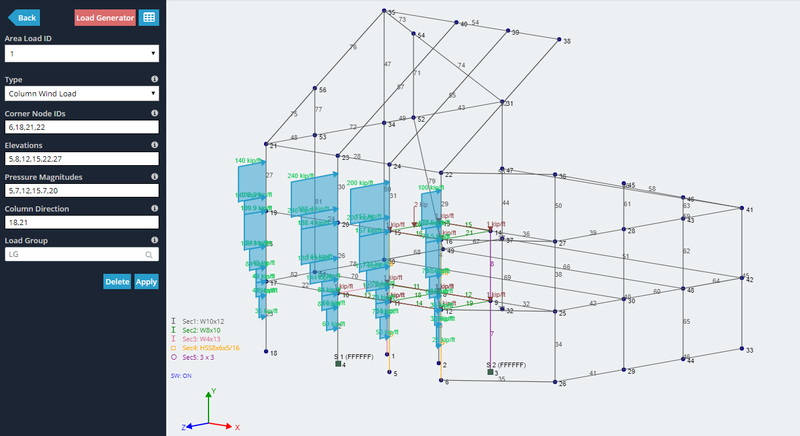 Area loads are equivalent distributed loads (DL’s) that are applied to members. 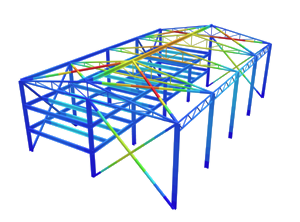 They are generated from the consideration of a pressure load (that would be applied to a plate) and how the plate (such as a slab) would transmit its load to the structural members which support it. 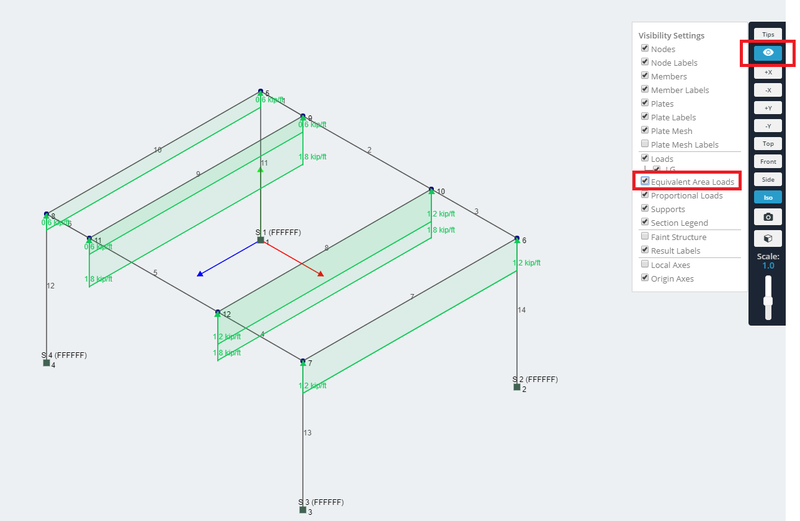 Area loads are useful when not wanting to model the plate, which may introduce unwanted stiffness into the model. 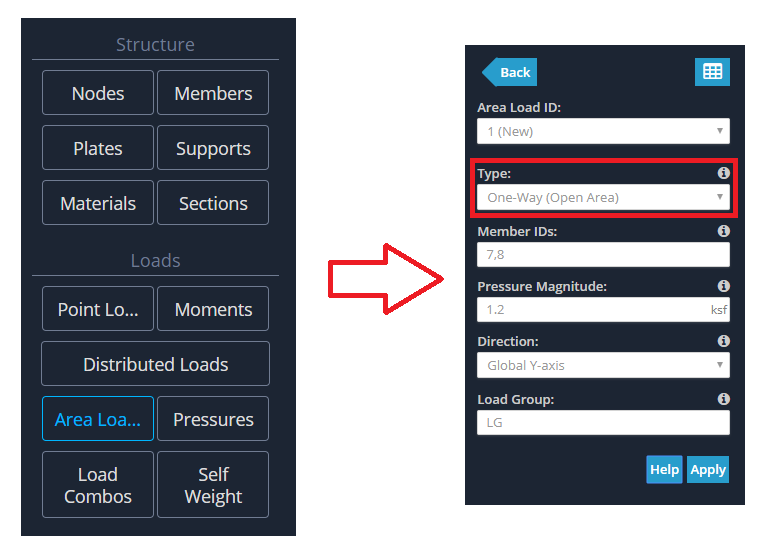 Like with other loads, you can assign a load group to area loads. To do this in SkyCiv, click the “Area Loads” button to open the menu. Select “One Way (Open Area)”. Then enter in two member ID’s. 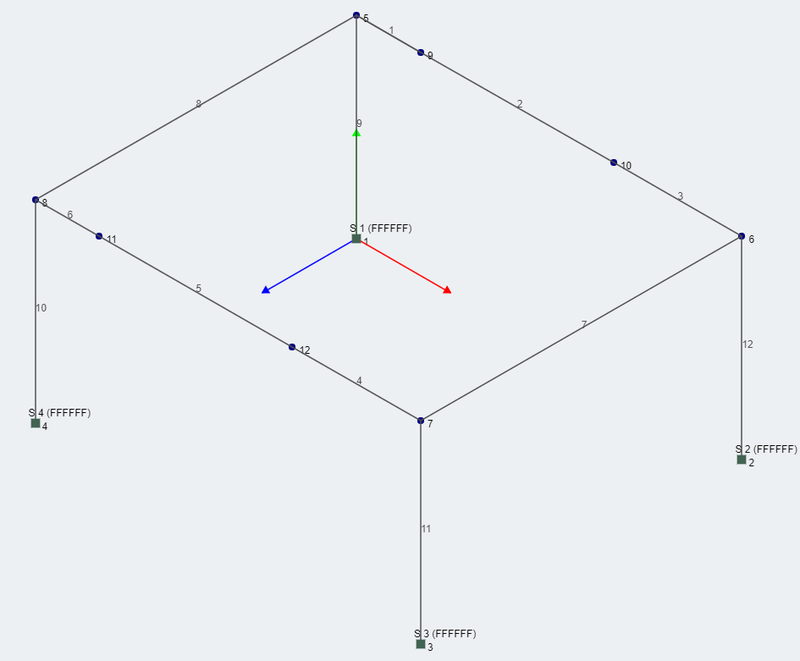 The name “open area” refers to the fact that the two members themselves do not form a closed polygon, and DL’s only form on these two members. Do this for members 7-8, 8-9, and 9-10. Note also the fact that there are two DL’s on members 8 and 9. 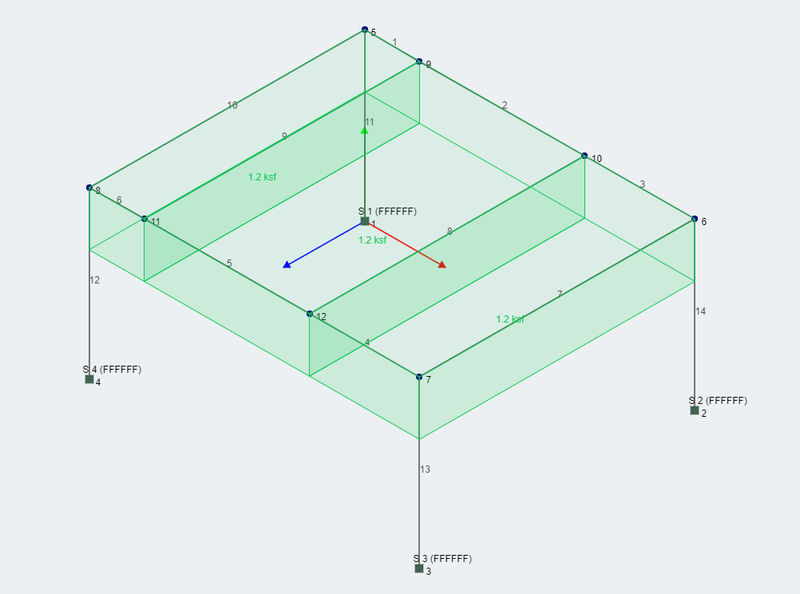 This is because these members lie in two areas that were selected to form area loads. 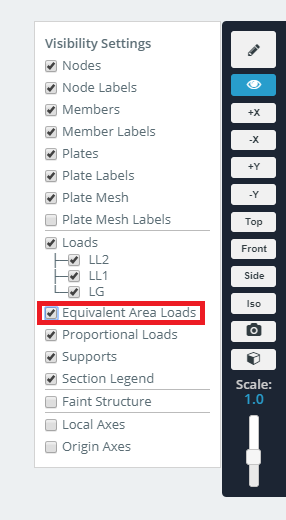 You are able to toggle the view from pressure view to equivalent area load (DL) form by clicking the view icon, and checking the box “Equivalent Area Loads”. 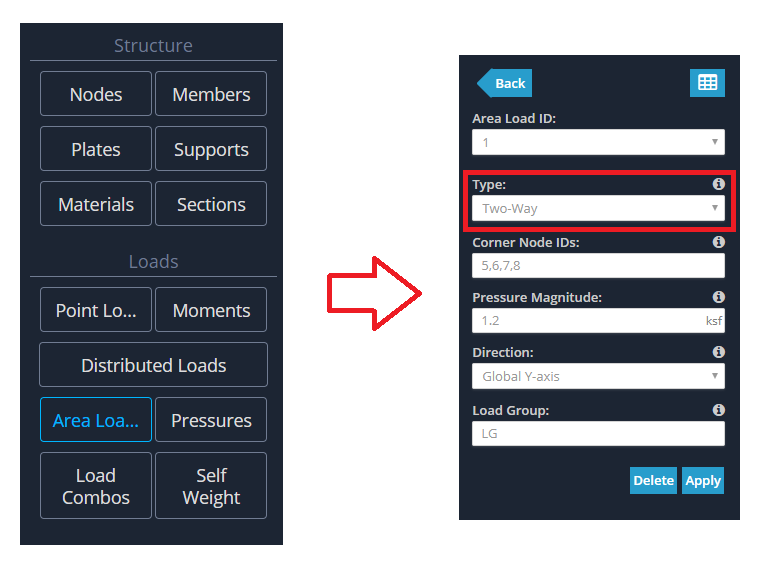 Instead of specifying members, simply specify 3 or 4 nodes (for this example we’ll specify the 4 outermost nodes), and the pressure value, and the area load will be generated. 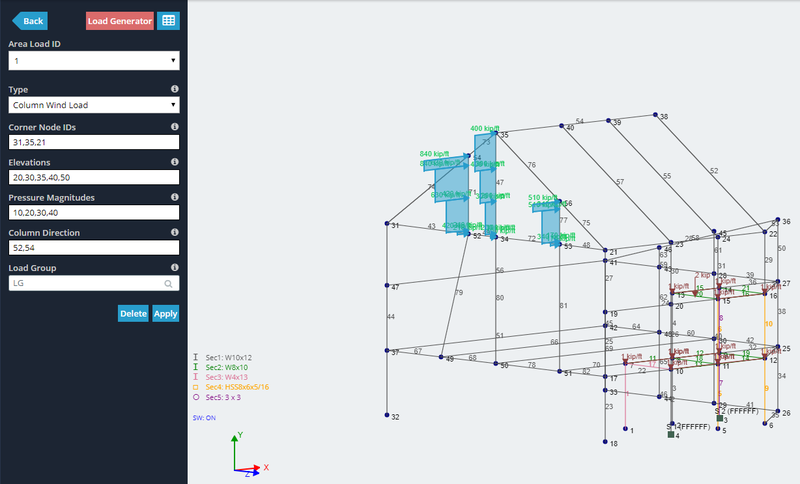 For this example, we’ll be using the same frame geometry as previous. 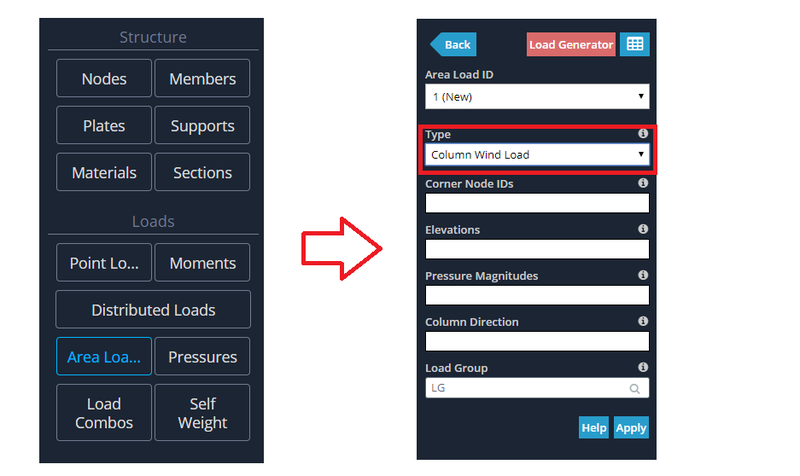 The latest area load to be added is called the “Column Wind Load”. 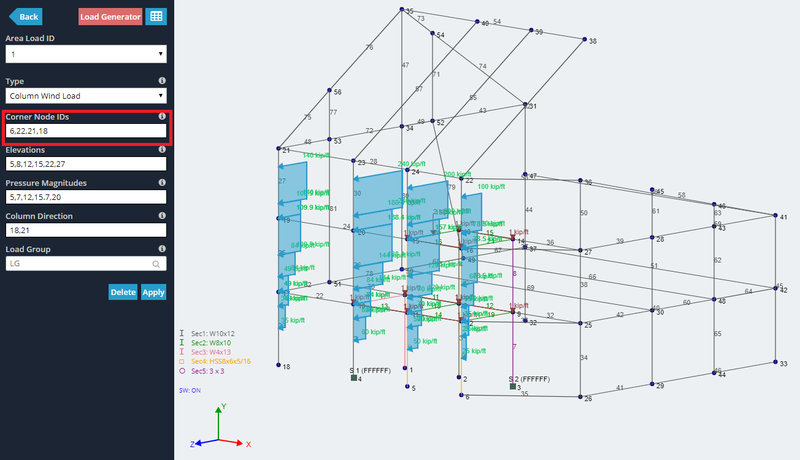 It is different to the other area loads, because it is applied in the context of a wind load applied to a closed structure (like a wall resting on a set of columns). 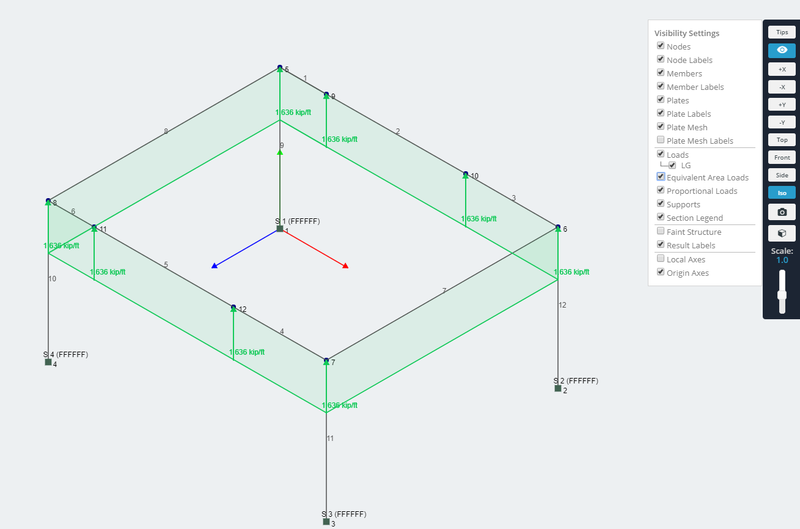 You are able to define a bounded plane without having that plane being bounded completely by members (overcoming the limitation of the previous area loads). 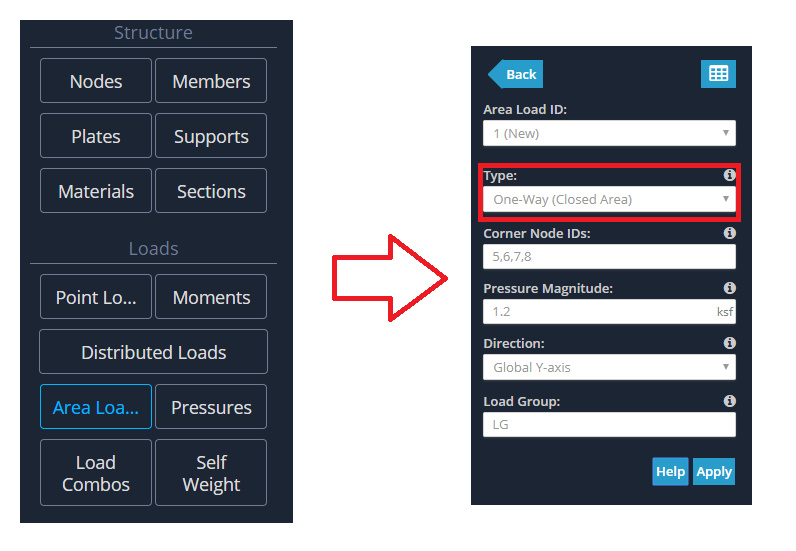 You are also able to supply elevation points, and define pressures that are present in between those elevation points. As a general rule of thumb, you should have 1 less pressure value for the number of elevation points that you define. You can offset from where your members start, and also stop before the members end. 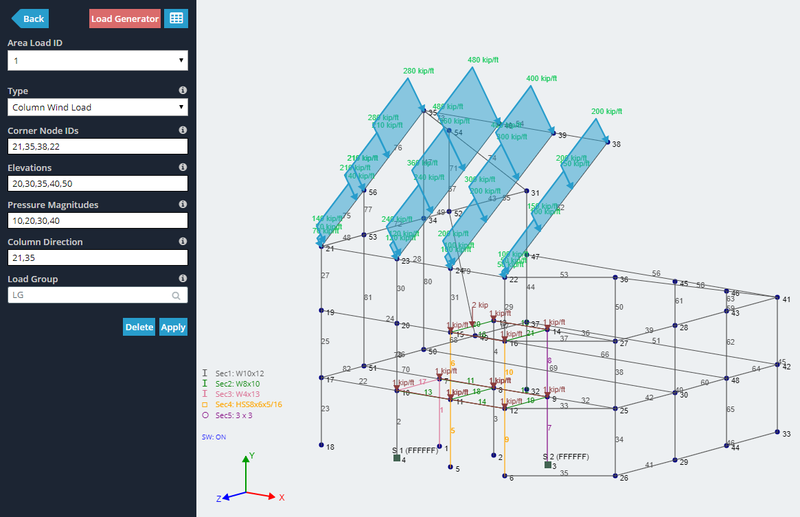 Note the columns are not connected by members at the base and that’s ok.
You can set the direction of your column wind load with your defininition of the node order for the bounding plane. 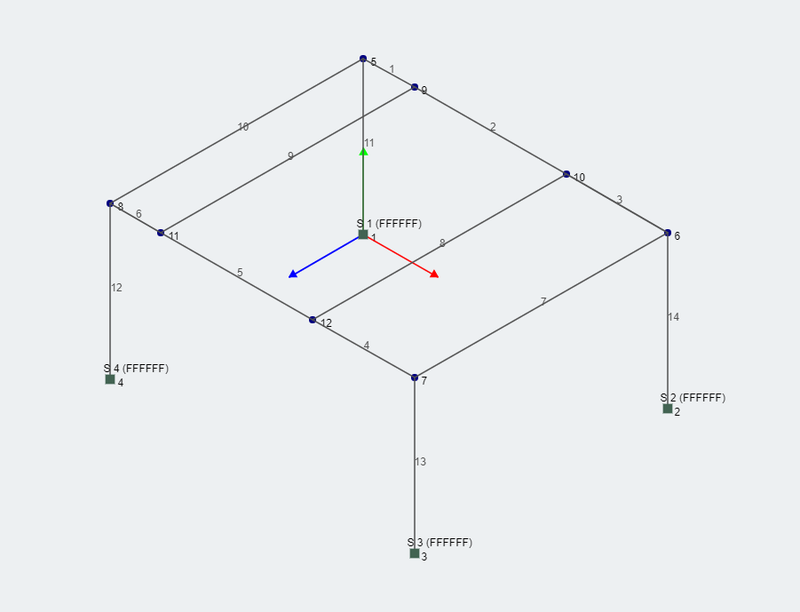 The direction is always perpendicular to your defined plane, however this gives 2 possibilities for direction. We follow the right hand rule for the direction here. 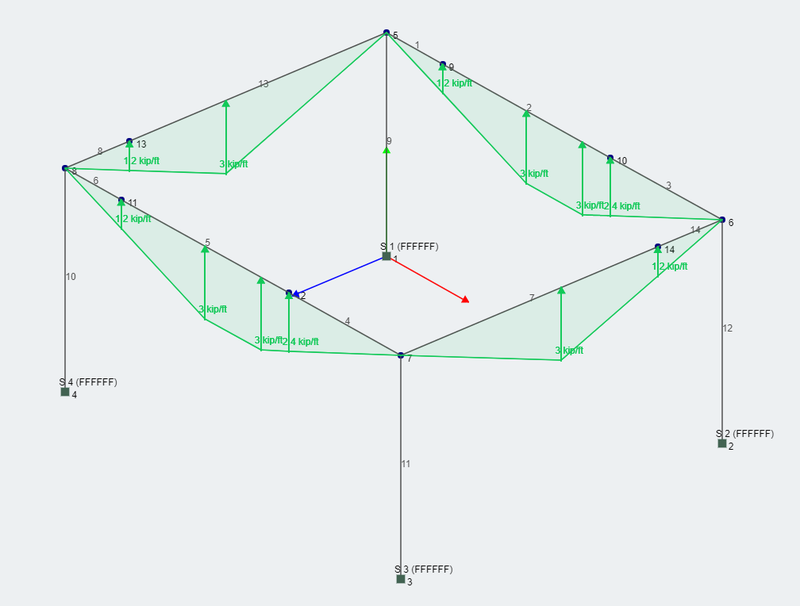 Look at the example below, the corner node ID’s is 6,22,21,18 (anti-clockwise) and if you curl your right hand in that direction, your thumb points in the direction of the generated wind load. If you’re not able to see the column wind loads, you may need to change your view settings by checking the “Equivalent Area Loads” option.